SANTA BARBARA, Calif., March 14, 2019 /PRNewswire/ -- More than 100 of the fastest video game players in North America gather here starting today for three days of non-stop action at the headquarters of the humanitarian medical aid organization Direct Relief. The speedrunning marathon is raising money for Direct Relief. In speedrunning, players compete for the fastest time to complete all levels of a game. The world's best players, their skills honed by hundreds of hours of play time, might complete an entire game in under an hour while a typical player might finish in days, weeks, or even months. Calithon 2019 will take place at Direct Relief's new headquarters and warehouse. The 155,000 square-foot facility is the largest distribution hub for humanitarian medical aid in the United States. Direct Relief is among the world's largest providers of humanitarian medical aid, providing medical aid to recipients in 100 countries and all 50 U.S. states last year. 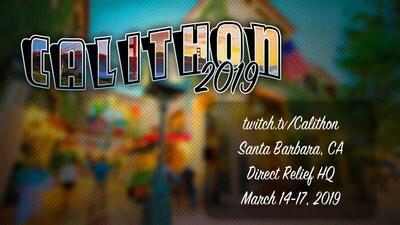 Calithon will be broadcast live on Twitch at https://www.twitch.tv/calithon, where viewers can donate to Direct Relief. Calithon broadcasters hope to raise as much as $50,000 for Direct Relief. "We're excited and humbled to bring the West Coast's premier speedrun event to Direct Relief, where our players will get to see and hear first-hand how their game-playing skills are helping people in need around the world," said Calithon founder Jeff Yochum. Calithon begins today at 4 pm PDT and continues through 10 pm on Sunday, Mar. 17. The speedrunning marathon (originally named Californithon) has been held annually since 2015. A mini-documentary about the event is available here: https://www.youtube.com/watch?v=KYblFdmYAH0. Video gamers and live-streamers on platforms including Twitch, Tiltify and Humble Bundle now comprise Direct Relief's largest supporter base. A humanitarian organization committed to improving the health and lives of people affected by poverty or emergencies, Direct Relief delivers lifesaving medical resources throughout the world to communities in need—without regard to politics, religion, or ability to pay. For more information, please visit https://www.DirectRelief.org.